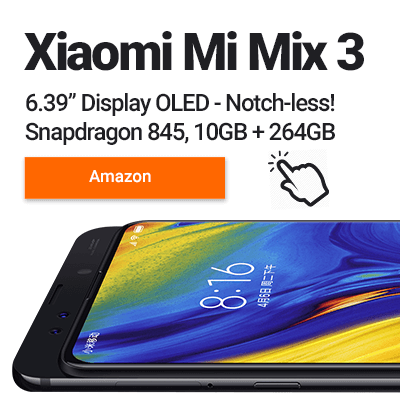  Will a Chinese smartphone work in the UK?  What Are Dual-SIM Phones? SOLVED! Turn your Home into a Cinema for the Price of a Weekly Shop! Let’s be honest, going to the cinema in the UK is expensive! 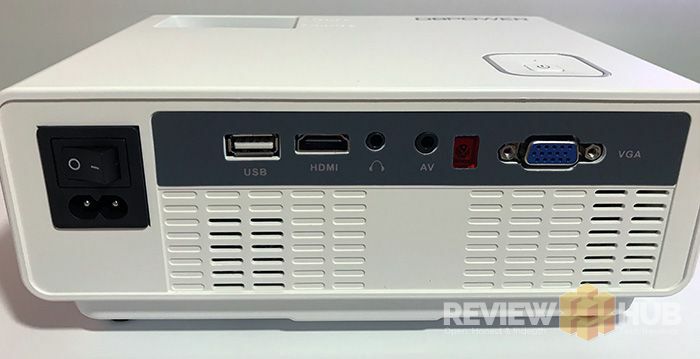 Two tickets, popcorn and a couple of cokes can easily set you back the same as this DBPower projector I’ve been reviewing for the last few weeks! Okay, so you’re not going to be watching a movie in all its 4K glory, coming out of a cinema projector you’d need a small mortgage to own. But that doesn’t matter as you still get the same cinema feeling even when using a bargain projector at home. Turn all those Netflix films sitting on your ‘watch list’ into a weekly cinematic event! In this in-depth review, I’ll be looking at one of the most affordable home projectors out there, the DBPOWER RD-810 Mini Projector. I’ll cover the Video Projection Quality, Design, Build Quality and Features before answering all your questions at the end. Transform your couch into a home cinema! Setting up the DBPOWER RD-810 projector is as simple as connecting it to your laptop using a HDMI cable. To achieve the best picture possible you can adjust the focus and keystone dials. The front legs are also adjustable so you can get the right angle on an uneven surface. 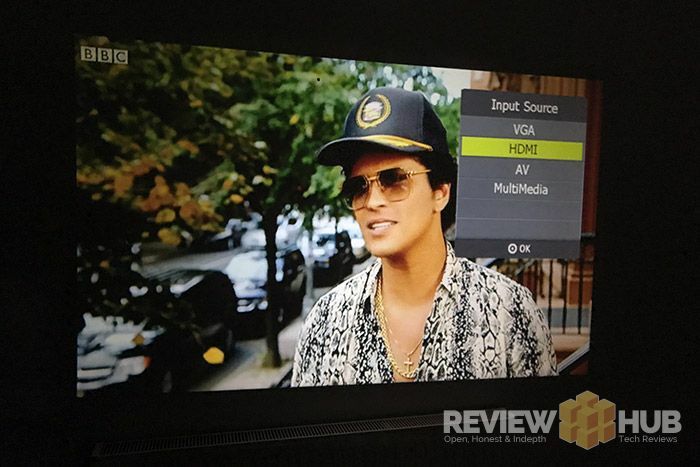 Next, you can manually adjust the brightness and sharpness of the picture using the remote. That’s it, it’s that simple. 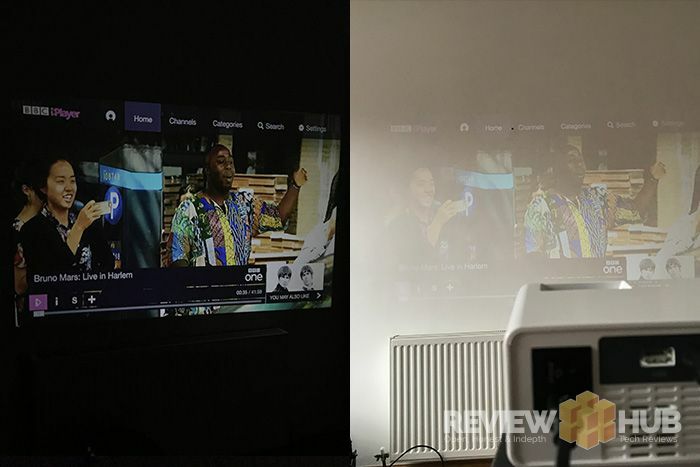 The DBPOWER projector is great for quick set up and on-the-go projecting, which makes it perfect to bring round to a mates house. Mario Kart session or Dexter Binge anyone?? 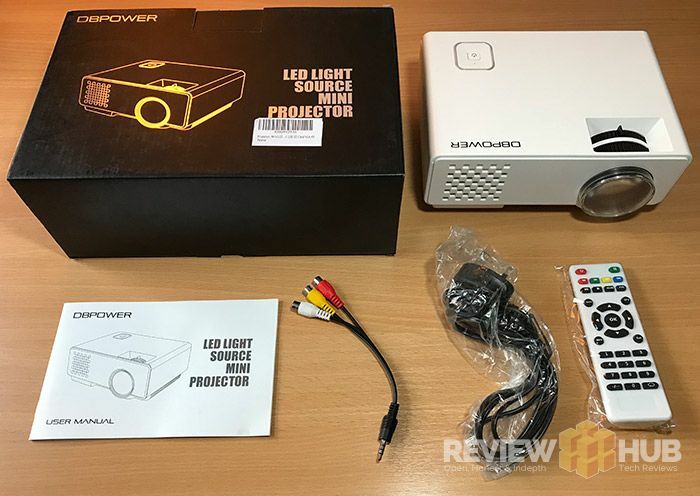 I wouldn’t be doing my job well if I said that the DBPower RD-810 projector offers excellent and vivid colours, a beautiful crisp display and cinema-like quality… it doesn’t. However, let’s remember that amazing price-tag! Who’d have thought you could create a mini home cinema for as little as £50! 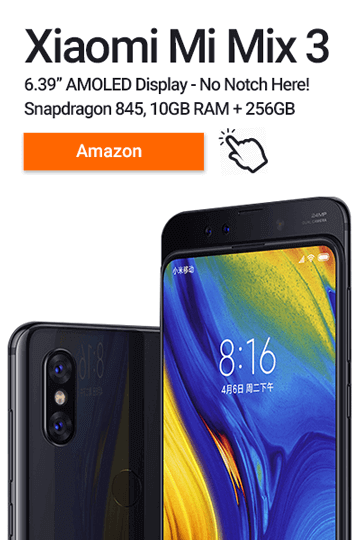 The picture quality, considering the low price-tag is pretty damn good! Tech Spec-wise, the RD810 can create a display size of between 30-176 inches with a throw distance of 1.5 to 5 metres. As the native resolution is only 800×450 resolution, the bigger you go the more pixel you’re going to start seeing. When you purchase a budget projector like the RD-810, one area that suffers due to cost is the brightness. Due to the relatively low lumen count of 1200, this is a projector you’ll want to use with the curtains closed. Using the RD-810 in bright rooms leaves the colours looking very washed out and the content difficult to see. Playing with the settings, I found the best picture mode was ‘standard’ as it keeps the picture looking natural. Vivid was too day-glow for me and soft was too… soft! So although the DBPOWER projector won’t be winning any image quality awards at the Oscars this year, its a really practical projector. It’s lightweight, super-cheap and is Plug’n’Project. Unlike other (more expensive) projectors the DBPOWER projector does have an inbuilt speaker. But… they may as well have not bothered! :D It’s tinny, quiet and not worth using. It’s a quick remedy, just plug in your regular speakers using the 3.5 headphone jack. As well as a full sized HDMI connection, the DBPower RD810 also comes with a USB Port. This means that you can play your movies directly off your portable hard drive or flash memory pen. The DBPOWER projector has a premium look and its hard white plastic casing will easily protect it on the move. The build quality feels sturdy with no rough edges or obvious joins affecting the overall aesthetic. Due to the small size and neutral colour, the DB POWER projector will look great in most homes, blending in easily. 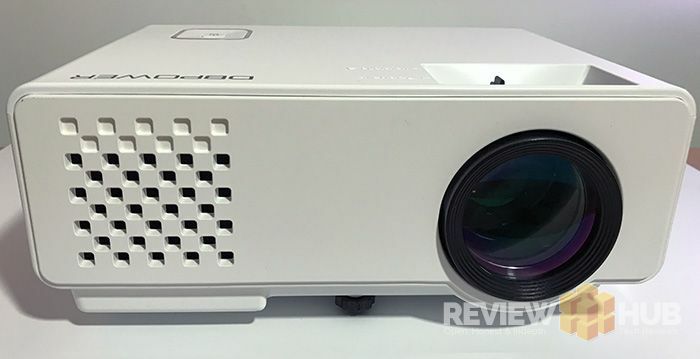 Overall, the build quality and design are impressive considering the projector’s price range. Although the remote does feel quite cheap due to its lightweight and bendy plastic, at least this makes it super portable! In the box, you’ll find a user manual, power cable, remote control and an RCA cable with 3.5mm headphone jack. A drawback is that the remote doesn’t come with batteries…come on DBPOWER! We’ve got ourselves a super portable projector which is perfect for taking to a party, a BBQ or creating an outdoor cinema evening! Picture quality is acceptable, given the price. Just don’t expect it to look as good as your 1080P Samsung TV. Currently travelling the world, Beki loves nothing more than testing the latest tech to come out of Asia, while sipping on a Mango Smoothie! Cubot R15 – Teardrop Displays For Everyone! We love reviewing and reporting on the not-so-well-known technology brands. All our reviews are 100% honest and truthful! We do this because we love it! We’re your tech friends that tell it to you straight!